I feel like I was taking crazy pills yesterday. I have been in a funk as it is and I don’t want to think about yesterday again. I have a habit of dwelling. No, not in vacant homes or anything-except that one time we were cleaning it out for the bank. I am a dweller upon negative emotions. Isn’t that what one conjures in their head when one thinks of emotional dwelling? I do. They never seem to be happy moments, nothing rose-tinted here. It doesn’t help that I also have a bit of a photographic memory; the ability to replay bad times over and over almost exactly the way they happened can make for a bad time. My way of life these days involves not thinking about yesterday, just learning and moving on but not completely forgetting because that is next to impossible and I don’t think called for. I take it, think about it for a day or two and try to move on. Until a song, word or smell hits and takes me back where I start the climb again…hopefully from a point a bit further than the last time I started over on the thought or event. Food can bring me back but mostly, it takes me to a place of contentment, if it’s good. I wanted a meal that could help me sooth my soul yesterday so I made a version of shepherd’s pie that turned out to be my second favorite kind. I have a habit of making different types of shepherd’s pie with different ethnic flairs, for instance, Mediterranean, Greek, Tex-Mex, Mexican, Caribbean and so on. This one combines one of my husband’s favorite sauces-Frank’s Red Hot and the must-have ingredient potatoes, this time with blue cheese and such. If you are not a fan of Frank’s (don’t tell my hubby Greg) but you can use a cocktail sauce or combination of spicy mustard and tomato paste to your taste approval. I added a touch of smoked bacon and smoked paprika and voila- I was pretty pleased again. If anyone is interested, Real Simple has an easy Shepherd’s Pie recipe when you are short on time that I used quite often back in the old busy workdays. I like a bit of spice or tang in mine so I add some spicy mustard or horseradish. Preheat oven to 375. If you are making your own potatoes, I would make them ahead of beginning the meat part and set out to cool. In a skillet, cook bacon on medium heat until nearly crisp and then add meat. Then, when meat is cooked fully, add onion, celery, carrots, paprika, salt and pepper. Cook until vegetables are softened and add white wine or stock, cook for a few minutes (still over medium heat). Stir in the hot sauce and taste, add more if needed. If you are using store-bought potatoes, heat according to directions and then add the sour cream and both cheeses, stirring in a bowl. 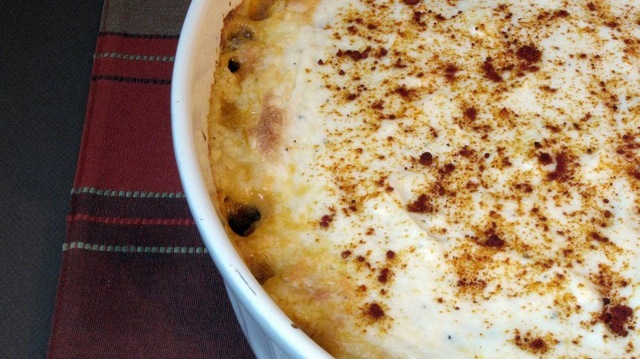 If you are using homemade potatoes, add the cheeses and sour cream here, mixing well. Place meat in the bottom of a casserole dish and place potatoes on top, either leaving them in dumpling shapes or spreading over the meat completely, it’s your choice. Sprinkle more smoked paprika over the top if you’d like. Bake for 30-40 minutes until golden and bubbly.